All foods (with the exception of sterilised foods such as canned produce) contain bacteria. Most of these bacteria are harmless or even an essential part of the production process such as in cheese. However, some bacteria can cause illness in humans if food is not handled correctly. Both Salmonella and Campylobacter are bacteria that occur naturally on a range of foods, including meat, eggs and all other fresh food including salads, vegetables, fruit and nuts. They are also considered to be ‘commensals’ of chickens, which means that they are part of the normal microflora of the chicken gut, where they can live without affecting the chicken. However, some strains of Salmonella and Campylobacter can cause illness in humans. Delivering safe chicken meat products to Australian consumers is an imperative for the chicken industry and significant effort is put into minimising contamination of chicken meat with these bacteria. 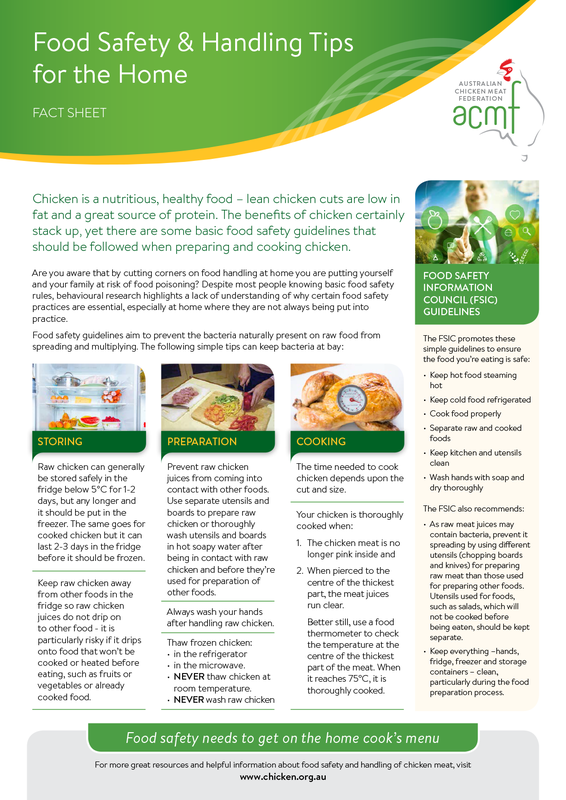 Handling of the raw chicken in the kitchen then becomes crucial to maintaining safety of the chicken meat. Efforts to minimise these bacteria in the supply chain start right back at the breeding farms, where the industry concentrates on reducing the prevalence of these bacteria in breeding flocks to limit the possibility for their transmission from parent hens to their day old chicks via the eggshell of hatching eggs. Hygiene in the hatchery is critical to ensure that the possibility of contamination of day old chicks within the hatchery itself is minimised, and heat treatment of feed manufactured for meat chickens helps to reduce the risk of these bacteria being introduced to meat chickens through their food. On meat chicken farms, a range of biosecurity measures are implemented to reduce the risk of introduction of foodborne pathogens (see biosecurity), water supplies are treated to kill bacteria in the drinking water, and the timing of feed and water removal prior to harvesting is carefully managed to reduce the risk of contamination between farm and processing plant and during processing. However, much of the effort on controlling these bacteria happens in the processing plant through careful removal of the gut/intestine to avoid any spillage, multiple washing and other cleaning steps along the processing line to remove any bacteria from the carcass, and rapid chilling to get the carcass quickly down to a temperature at which bacteria can’t grow. Chicken products then need to be carefully stored and managed through their distribution to retailers, restaurants, food service providers and wholesalers and further processors to ensure appropriate food safety standards are maintained right up to the point that the consumer receives it. In particular, once the chicken leaves the processing plant cool room, it is essential that it stays cool at all times up to the point that it reaches the ultimate purchaser, or is cooked. 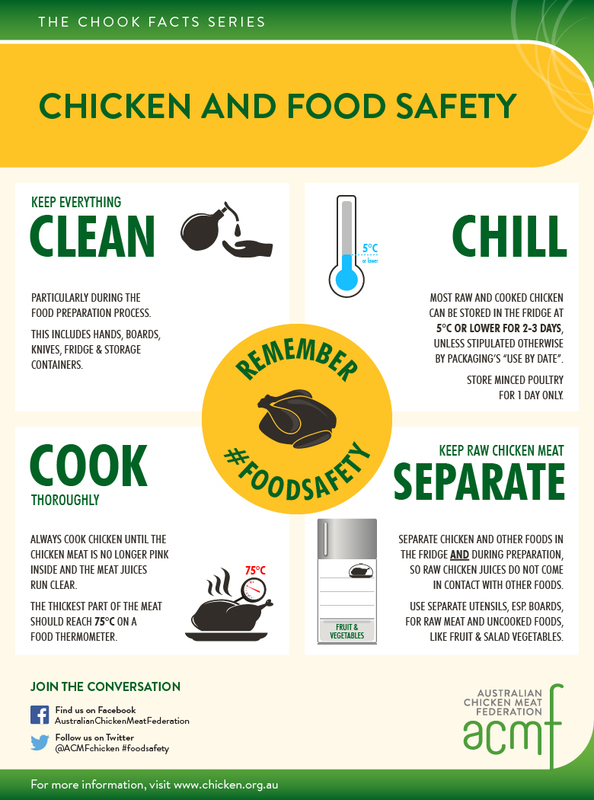 The chicken meat industry supports safe food handling right through the food supply chain, through research, through its own production and processing quality assurance systems and through activities to educate consumers in the safe handling of food. Food standards are set by Food Standards Australia New Zealand (FSANZ), a statutory authority within the Australian Government’s health portfolio. The Primary Production and Processing (PPP) Standard for Poultry Meat (Standard 4.2.2) is part of a series of national food safety standards. The standards can be found here. In addition, the chicken meat industry complies with a range of standards and codes of practice established by Governments and also private schemes aimed at ensuring that the ultimate product is safe and was produced in line with all the requirements of animal welfare, occupational health and safety and food safety. The basic aim of food standards is to ensure that all food offered to consumers is safe to eat. Any risk from bacteria is eliminated if meat is cooked properly and care is taken not to contaminate other cooked foods or those to be eaten raw, such as salad. Below are some resources to help consumers and food service businesses understand some of the most important things they need to do to make sure they do their part in ensuring the safety of the food they serve their families and customers. Perhaps the most common food handling failure in the kitchen is to not keep raw meat clearly separate from cooked and ready to eat meat, salads and vegetables during storage and most importantly during food preparation. By cross-contaminating food that will not be subsequently exposed to heat prior to its consumption, harmful bacteria can still be consumed. If you plan to freeze the fresh meat, it’s best to do this immediately. Do not freeze raw meat which is not completely fresh. The freezer temperature should be below -20°C. Should Chicken Meat be Washed? 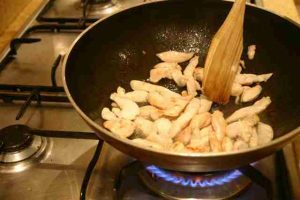 It is not recommended to wash chicken meat before cooking. This recommendation has the endorsement of the Food Safety Information Council (FSIC). Washing is likely to splash raw meat juices and any bacteria in to the kitchen sink, bench top and utensils and washing will not remove all bacteria. Modern chicken meat processing means that raw chicken meat is much safer now than it used to be when washing may have been recommended. Make sure you wash hands thoroughly and immediately after handling raw chicken meat. 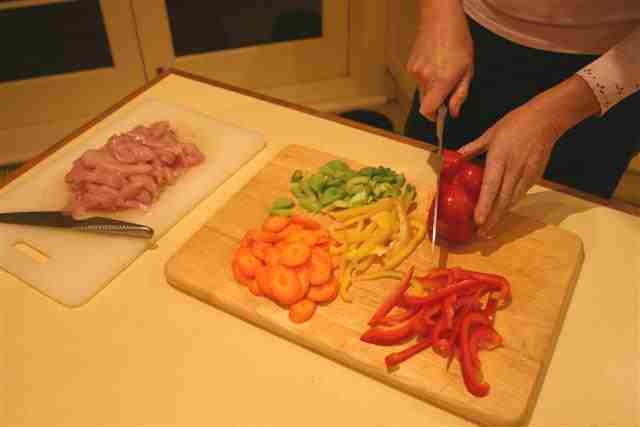 Only cooking will destroy all bacteria effectively. Cook chicken thoroughly. 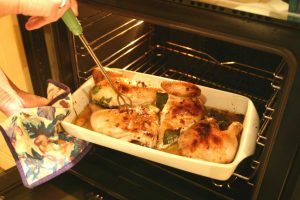 The high temperatures reached in roasting, baking, frying and boiling kill food poisoning bacteria as long as all internal and external parts of the chicken reach the right temperature (75°C). Use a skewer to check that chicken meat is properly cooked by piercing deeply through the thickest part of the meat. When cooked properly, the juices will run absolutely clear, not pink. 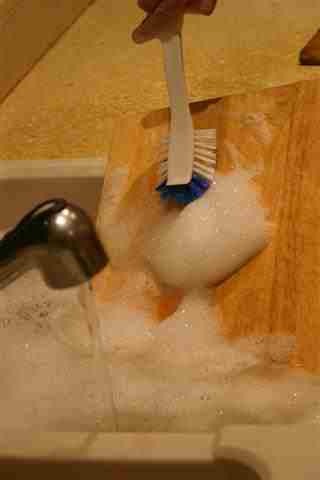 But the best way to check is by using a food thermometer. Chicken not only tastes best when it is cooked right through but it is also “the safe thing to do”. Any bacteria that could potentially cause illness will be destroyed by the cooking process. But how do you know when a piece of chicken is fully cooked? The traditional test is to pierce a skewer into the thickest part of the chicken, remove the skewer and observe the juice that oozes out – it should be clear and not show any sign of pink (blood). Another traditional way is to cut into the meat and check that the colour of the meat is no longer pink. This latter method is not always reliable because some meat, even when fully cooked, will retain a pink colour. The most reliable method is to use a meat thermometer and to measure the temperature at the centre of the thickest part of the piece being cooked. When the temperature has reached 75°C the meat is fully cooked. 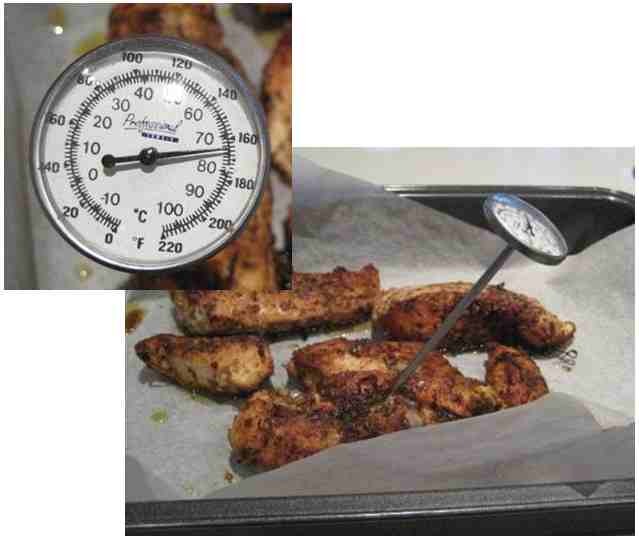 Check out this Food Safety Information Council video clip on using a digital thermometer for checking whether your chicken is cooked and for more information on how to use a meat thermometer, see here. Stuffing should be treated with special care. Stuff loosely (not more than 2/3 full) just before cooking and remove stuffing immediately after cooking. Fortunately, chicken meat is much easier to cook correctly than most other meats because chicken does not get tough if it is cooked a little longer. So if you are not sure, err on the side of caution (within reason of course) and you will enjoy a great tasting and safe meal. 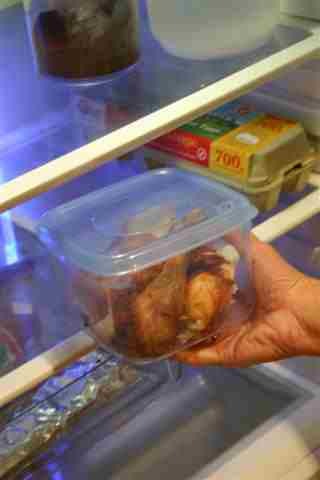 Leftovers should be stored in the fridge immediately or frozen if more than one to two days’ storage is required. The rules are straight forward, but a simple poster or fact sheet stuck on the fridge or your kitchen cupboard will make sure that the whole family becomes and remains food safety aware.